When my adviser suggested I retype, as in start a whole new Word document, and actually re TYPE all the words I’d just written, all the PAGES– 196 of them–I thought for sure he was crazy. “Troglodyte,” I muttered under my breath. Clearly he didn’t understand the power of computers; he would have probably suggested I use an actual TYPEWRITER if he knew I owned one. I mean the beauty of word processing is that it offers tools every writer loves: the File–Save As, the Copy/Paste, the Cut/Paste, the Search-and-Replace, Spell Check, not to mention the Undo! And then something happened. I got stuck. I didn’t know what to work on next, where to begin… and so in frustration, and rather than stare at the computer screen for hours, toggling between the chapter called “Big Messy Chapter 4”, Facebook, and email, I decided to give it a try, the re-typing thing. Maybe I would feel like I was doing something other than stare. Maybe some sort of muscle memory of writing would take over and I could just write again. I stacked my earlier drafts on my desk (not the one pictured above), created a new Word document, titled it “Starting from Scratch,” and began typing. From the very beginning. As I typed I looked at the comments from my professor and my colleagues. When I saw a section wasn’t working, I didn’t re-type it. When the comments were something like “say more” or “not clear” or “and what do you think of that NOW” I would try to answer those comments as I retyped. Sometimes a re-typed sentence would become a paragraph of NEW writing. Sentences that needed restructuring got restructured. Paragraphs that were not in the right place, were typed into the proper section. And the best part, the person typing the new draft, was the person who had learned from the earlier draft, who had a different take on it, who was wiser than the person on the page. In this way I deepened the reflection, and looked for smarter, more creative ways to say something. I can’t tell you how it irks me that this is one more thing my adviser was right about, but now I swear by this method. I use it for almost every revision. And I’ve thought a lot, and for me there are a couple of reasons why this works. First, if you’re as obsessive about polishing prose as I am, each time you “touch” a sentence you look at it for improvements. You change a word, you move a phrase, you make it better. And by re-typing an entire poem/essay/short story/ book you take the opportunity to examine every single sentence at the letter-by-letter level. And most importantly: we’ve all heard some version of the advice, “you have to be willing to kill your darlings,” a quote attributed to everyone from William Faulkner, some dude named Sir Arther Quiller-Couch, and more recently Stephen King. But the truth is: it is painful to “kill your darlings,” to hit the delete key and disappear those perfectly forms bits of prose that either leapt from the tips of our fingers fully fledged, or were toiled over for days, weeks maybe, years even. It’s like ripping a little piece of your heart out. BUT… if you re-TYPE, you don’t have to Select/Delete. You don’t have to CUT those words out…. you just don’t bring those words into the new document. So set aside your doubts and give it a try then let me know how it works for you. I’ve often wondered if the generation of writers who had no choice but to retype on their Remingtons or Smith-Coronas had a leg up on us computer users, simply for the reasons you mention. And they have stronger fingers! I might give it a try sometime, but… you happen to know anyplace I can get a new ribbon? I probably take this advise to the extreme– typing drafts on my typewriter, writing them out by hand, typing them on the computer, and sometimes–ok almost every time– starting the whole process again. I suspect that we tend think of writing as something that we do in our head, but it is also a physical activity. Also you should be able to find typewriter ribbon at any office supply store. I’ve been buying from Staples as of late, but I’ve bought it from Office Max in the past. 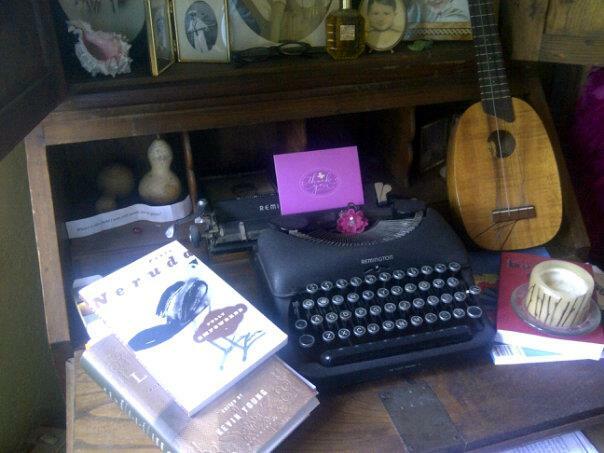 Jenn K I can totally picture you typing away on a typewriter… curious what kind you have? A Smith Corona Galaxie Deluxe. I am a big proponent of this strategy! Now the question is…can I do it one more time in the ten days before I submit!? Hmmm … I’m gonna think about this. Right now I’m readying what I’m calling a “Final Draft.” Of course, it won’t be. Connie will tinker and then I’ll tinker again. But believe me, we’ve come a long way from my First Draft. What I’m doing is reading it out loud. You hear the rhythm or lack there of, you catch the missing plural “s,” you trip over a clumsy construction, and change lots of present participles to active verbs, etc. etc. Believe me I’m suffering along with you as you count your pages. I count words. You have inspired me, my friend. I love this idea for the reasons you point out. I feel like I’ll be able to be truer to the writing and rewriting rather than trying to make the “old” version work. I’ll let you know in a few months how it worked. Thank you. Hmmm. I normally write my rough drafts in longhand wherever I happen to be (coffee shop, waiting room, park, etc) and then a few days (or months) later when I’m working at the computer and not feeling particularly creative, I type them up. And yes, I catch all kinds of things when I do this. Often it ends up being a very different piece. Definitely more concise. I get some feedback and revise some more. After sufficient tinkering I usually read it aloud. It’s amazing what you “hear” when you do this. When I think the piece is halfway decent, I read it at a local writer’s salon. For some reason reading for an audience helps me catch different things than when I read to myself. More revision generally follows. But I never thought to re-type the whole damn thing. GM is an evil, evil man. Sigh. Now I’m going to have to try it. Love this. Am working on doing some of this with my essays, I remember doing the same thing with my first novel, only I did it by hand, with a pen and paper (remember those?). Twice. It really does help. Thanks for posting. I’m going to do this with my non-fiction piece. It’s really gotten out of my reach, and returning to the ‘original’ draft will be helpful.